SUMMARY: Accountable care organizations (ACOs) create integrated delivery systems that encourage teams of physicians, hospitals and other providers to collaboratively coordinate care for ACO members. 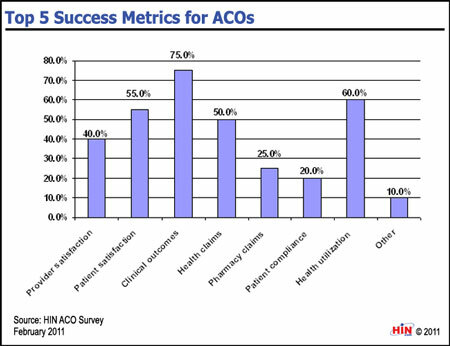 We wanted to see which metrics organizations use to measure ACO success. The February 2011 Accountable Care Organizations e-survey by the Healthcare Intelligence Network set out to assess the industry’s awareness of and readiness for ACOs. Download the executive summary of 2011 Benchmarks in Accountable Care Organizations: Metrics from Early ACO Adopters. 2011 Benchmarks in Accountable Care Organizations: Metrics from Early ACO Adopters delivers actionable data from 228 healthcare companies that responded to HIN's February 2011 ACO readiness assessment. The result? A comprehensive snapshot of ACO awareness, participation, administration, targeted populations, payment models and much more from healthcare companies already immersed in the ACO architecture. 2011 Benchmarks in Accountable Care Organizations: Metrics from Early ACO Adopters is available from the Healthcare Intelligence Network for $137 by visiting our Online Bookstore or by calling toll-free (888) 446-3530.